Silver nails, yay or nay? I'm not usually a fan of metallic nails, but a metallic silver always seems to look pretty good, they can be fun and glamorous at the same time. 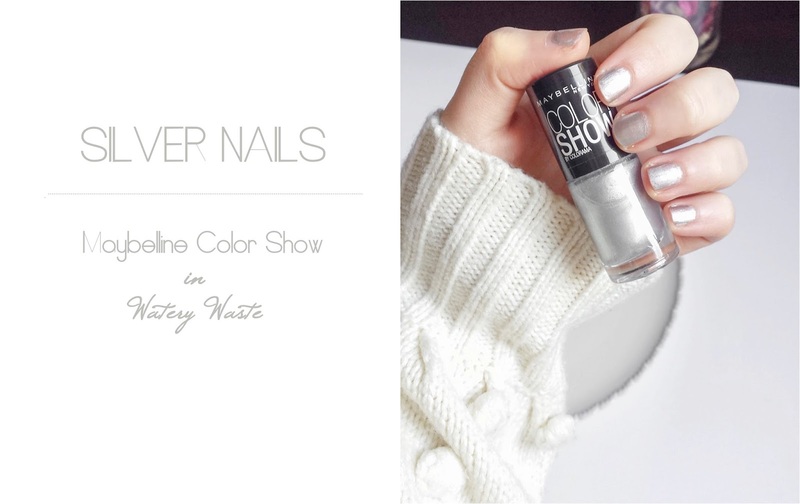 I recently got this nail polish at the drugstore, the Maybelline Color Show in Watery Waste (horrible name btw), a light shiny silver colour. The formula is quite thin and sheer and it requires at least 3 coats to get an opaque result. I've been wearing this colour on my nails all week but I'm not sure if I like it or no. I've seen lots of pictures of girls wearing silver nails on Pinterest and I think the colour looks nice but I'm not sure on me. Maybe the colour is too pale for my liking. But I really like the idea of silver nails, I think it looks chic and fun. Maybe I need to try other shades of silver. 4 comments on "NAILS OF THE WEEK: SILVER NAILS"
I'm with you on the name- terrible! Metallic nails are definitely hit or miss for me too.